Eggplant, a native of India, is actually a pear-shaped berry and part of the so-called deadly nightshade family, which includes potatoes and tomatoes. And despite the mythology of their poisonous effects, eggplants, particularly their skins, contain high amounts of antioxidant phenolic compounds, cancer-fighting elements that eat up free-radical scavengers in the bloodstream. Thus, these once feared “mad apples” actually promote good health. This delectable “fruit” is an ornamental garden treasure and a culinary staple in many classic Mediterranean and Asian dishes. 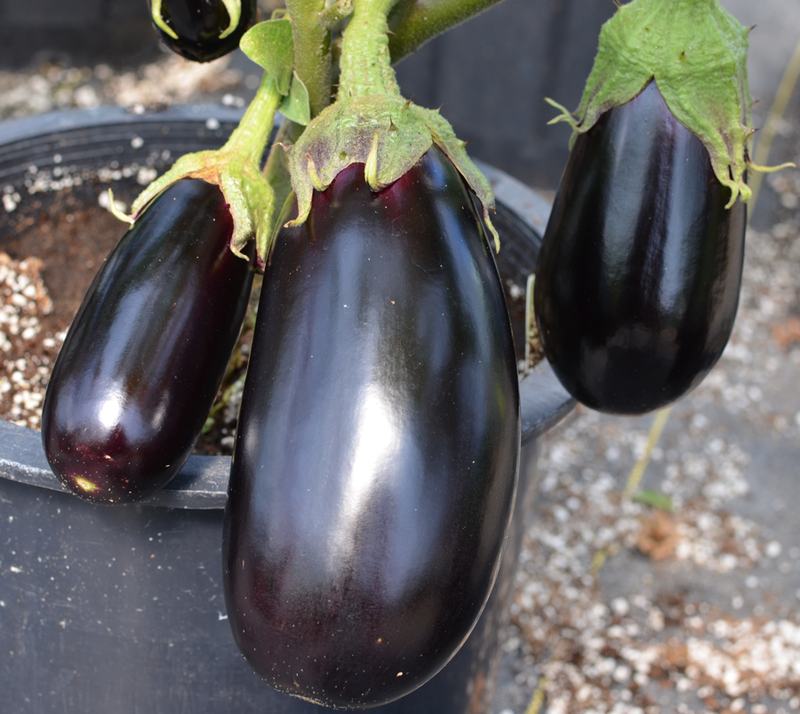 With the proper care, your eggplant crop will produce a beautiful harvest of fruit. They grow well in very sunny, fertile, well-drained locations. They can withstand hot weather, but provide a generous mulch of shredded leaves or other biodegradable material to keep the soil relatively cool and moist. Keep plants well watered or the fruit tends to become small and bitter. A nice, steady supply of moisture is needed, but not so much that the soil remains soggy. A drip system or a soaker hose is ideal for even watering. Use a small tomato cage or stake plants at the time of planting for extra support. 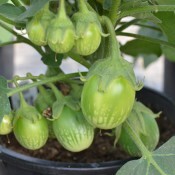 Smaller fruited varieties can be grown in containers. Make sure your container is large enough and keep it well watered. 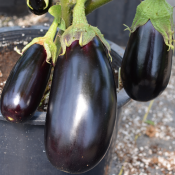 In cooler climates, the best option may be growing eggplants in containers as they can be moved to a protected spot whenever a cold spell threatens. Plant eggplant near amaranth, beans, marigolds, peas, peppers, spinach, and thyme. Fair source of iron and potassium; low in calories and sodium. 1 cup of cooked eggplant has about 38 calories. Begin to harvest eggplants as soon as the first fruit reaches a desirable size. Keep picking them and do not let them get too big. Rather than breaking or twisting the stems off, use a knife or pruning shears to cut the fruit off leaving 1 inch (2.5 cm) of the stem attached. By continuous harvesting, you will encourage more fruit to set all the way to frost. Rinse clean, pat dry and store in the refrigerator for a few days.